On Saturday, July 28, 2012, members of the Atlanta Genetic Crimes Unit and the Food Supply Rescue Coalition descended on the Trader Joe’s store located at 931 Monroe Drive, Atlanta, GA to shop for some truth. We participated in “Shopping for Truth” at Trader Joe’s yesterday in Portland, ME with The Conscious Caravan and our family and kids in tow. 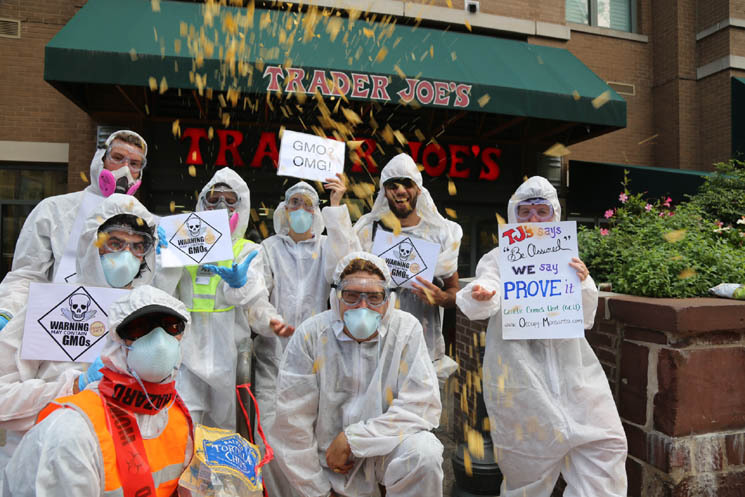 We didn’t dress up in hazmat suits, nor did we bring caution tape, but we were on an Educational Mission to ask them to verify their Non-GMO claim on their Trader Joe’s brand. 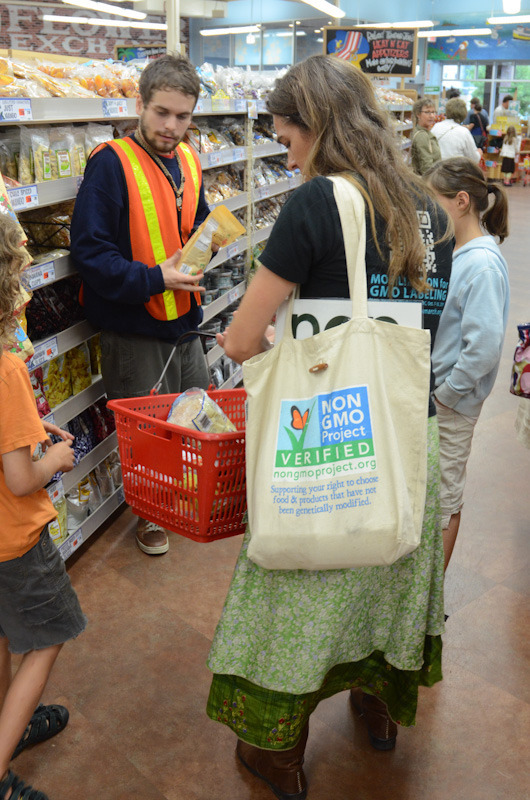 I started off telling the kids we were going on a treasure hunt to find foods that were safe to eat, and to look for either Non-GMO Project Verified, or USDA Certified Organic. They could all pick out a snack and then we would find out what was safe and what was not. Simple enough, right? Educating our next generation on what is in our foods. They gravitated to the fruit at first, and we sorted over mostly conventionally grown produce, only to realize there was only one lone island with Organics, limited selection indeed. Then, they went for the dried fruit and granola and crackers. Normal everyday healthy fare for kids, right? So it seemed. 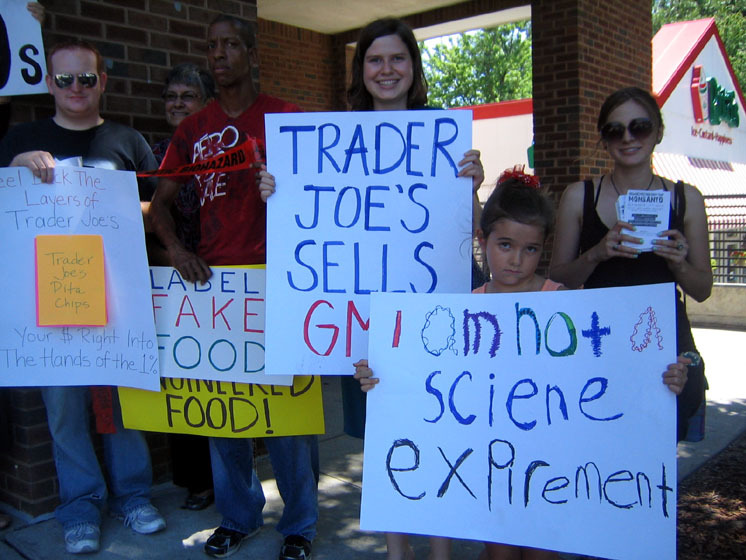 On Sunday, July 29, 2012, members of the Genetic Crimes Unit descended on the Trader Joe’s store located in the West End neighborhood of Washington, DC to shop for some truth. This video by Mike Flugennock documents the day’s action. 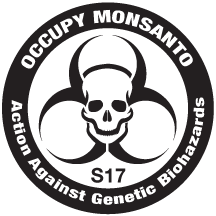 If your GCU has video from Shopping for Truth at Trader Joe’s please send link to Incident@Occupy-Monsanto.com with a short paragraph describing the content of the video. 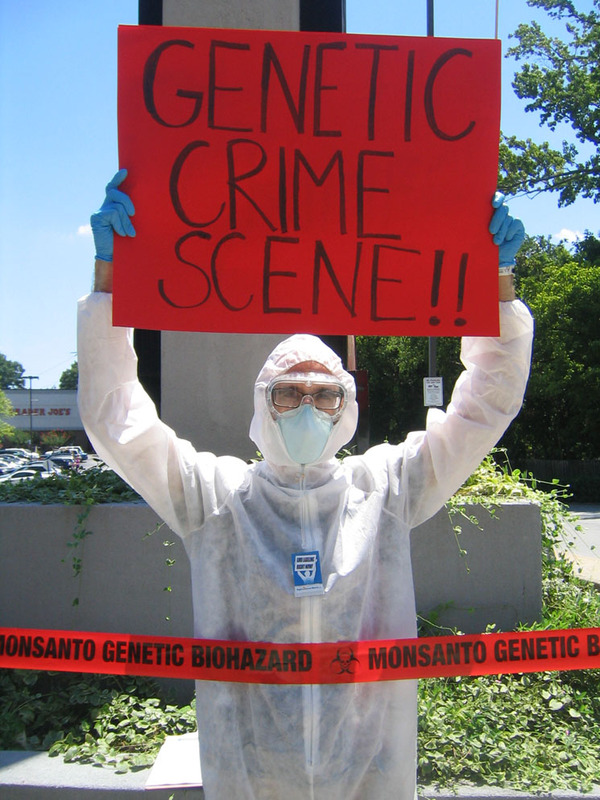 WASHINGTON, DC— On Sunday, July 29, 2012, Occupy Monsanto’s agents of change with the Genetic Crimes Unit (GCU), a group designed to protect America from genetically modified foods, will ‘Shop for Truth’ at Trader Joe’s during a nationwide weekend of activism targeting the chain grocer. 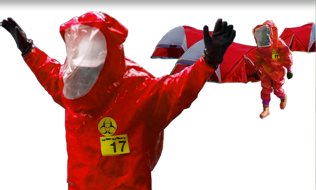 The DC-area GCU will gather in hazmat suits at noon outside the Trader Joe’s location at 1101 25th St. NW, Washington, DC to demand that the Monrovia, California-based Trader Joe’s provide proof that the foods sold in their stores under their own brands are free of Monsanto’s patented genes. According to the Trader Joe’s website, the grocer sources all ingredients for its private label brands from non-genetically engineered crops, but provides no proof of this claim, nor does the grocer work with any known 3rd party verification services. The GCU believes that Trader Joe’s may be genetically contaminated by Monsanto’s gastronomical experiments and will be joining other GCUs from San Francisco, California to Portland, Maine over the weekend to demand that Trader Joe’s go beyond mere assurances and provide its customers with proof of their claims. “If Trader Joe’s takes pride in the food they sell, why do they hide the truth from their customers?” asks GCU Agent Stacey Sanchez, “We don’t trust corporations like Trader Joe’s that have a profit motive, so the burden of proof lies in the corporate offices of Trader Joe’s.” The DC-area GCU has reason to believe that Trader Joe’s non-private label foods, which are not certified USDA Organic and contain corn, soy, canola, or sugar beets, are likely to be contaminated with genetically engineered ingredients.